Is that a personal database in your pocket? A superb 1.0; it's not perfect yet, but it's very good, and a steal at £2.99. This app does the impossible: it makes databases cool. When the Mac version of FileMaker's personal database launched in 2008, it felt like the missing module to Apple's iWork suite. Slick, pretty and easy to use, it came prepopulated with a bunch of useful, real-world templates. Now there's an iPhone version, and it's just as lovely. It too has ready-built templates – a recipe book, event planning, expenses and more – though you can build your own. 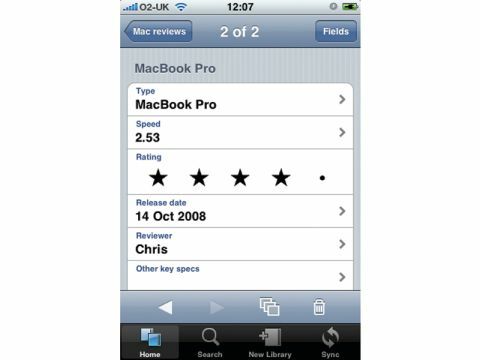 There's support for lots of field types – multiple choice, ratings, dates, times, durations and more, though some advanced data types, most notably calculations, require Bento for Mac as well (see here for more information). It all feels very iPhone-like. You can choose which fields are visible and sortable in the list view, and adding records is a cinch. Still, this is a great little database with room to grow. There's no interaction with iCal at the moment, though it reads your address book live – and the single-user Bento model means even small workgroups need to look to the full, scary FileMaker range. But, its ease of use and ability to sync wirelessly with Bento for Mac mark it out as little short of a triumph.